During the summer of 1957, Picasso (who had become honorary director of the Museo Nacional del Prado, Madrid), turned the third floor of La Californie, his house in Cannes in the South of France, into a studio. While in this studio, from August 17 through December 30, 1957, he worked on a large series of fifty-eight canvases in near isolation, allowing few visitors to see his work. Forty-four of these canvases were directly inspired by Diego Velázquez’s masterpiece Las meninas (ca. 1656), which he had first seen as an adolescent at the Prado and used as a model for copying his jesters and dwarfs. 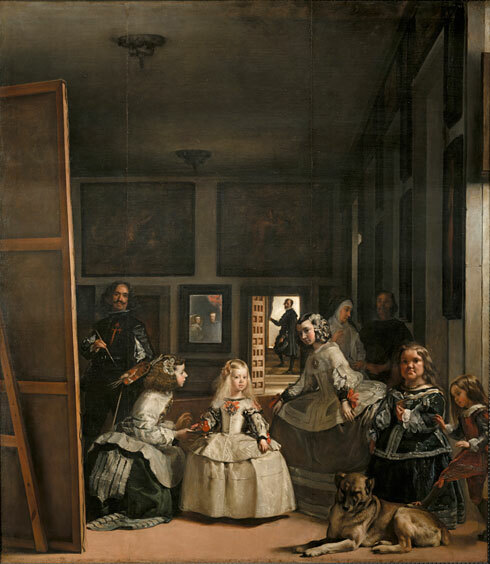 This horizontal painting, The Maids of Honor (Las Meninas, after Velázquez), is the first, largest, and most elaborate of the series, and is the most faithful to the vertical composition created by Velázquez. All of the figures from the old master’s canvas are present, playing the same roles and occupying similar positions. Investigating the complex spatial organization and figure grouping of Velázquez’s famous canvas, Picasso employs an effectual and fragmented black, gray, and white palette in order to provide structure to the space and its figures. Velázquez himself looms larger in Picasso’s version than in his own, an homage to the old master as creator, and holds two palettes rather than one, though neither canvas reveals what the artist is painting. 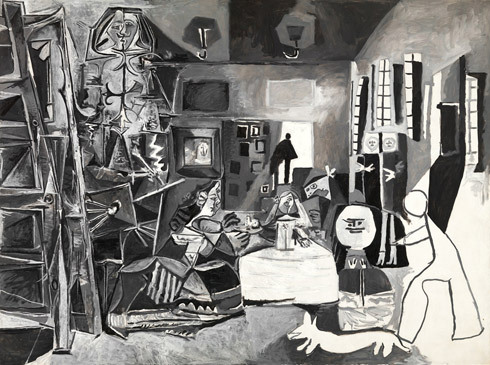 While light floods into the room in Picasso’s version, the atmosphere is more muted in Velázquez’s original, and Picasso’s dog Lumb occupies the same territory as the seated Mastiff in the older Spaniard’s work. Picasso’s connection to Velázquez began as early as 1895 and recurred throughout his career in many guises, including the ballet Las Méninas. Created by Léonide Massine, with music by Gabriel Fauré and costumes by José María Sert, Las Meninas premiered at Serge Diaghilev’s Ballets Russes in Rome in 1916, where Picasso would meet his future first wife, the Russian ballerina Olga Khokhlova. Picasso donated his series in its entirety in 1968 to the Museu Picasso, Barcelona, in memory of his great friend and secretary Jaime Sabartés, who had recently died. By painting so many variations, he sought to understand the key elements of a work he so admired while also giving his Meninas a life of their own. Significantly, in the mid-1950s and early ‘60s he worked on other historical series inspired by the great masters of the past, in an effort perhaps to ensure his indelible place in art history. © 2012 The Solomon R. Guggenheim Foundation (SRGF). All rights reserved.